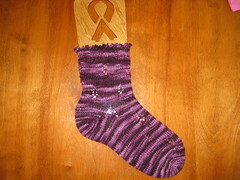 This is my donation to the Girl's Talk basket for the Wilton Blueberry Festival. It's done in 50% Merino and 50% Tencel. It was splitty to work with, but other than that, the pattern was awesome. It is Not A Drop, written by Arlene of Arlene's World of Lace. It's reversible, and I loved it. I may make myself one, but wider. Or make a door curtain (regular curtains?) for the daughter. Of course, I'd have to add beads to the end, and while we were at Enchantments for my birthday she expressed much interest in the beaded door hangings. We'll see. All 25 of my lily plants have poked their heads out of the garden. I can't wait for them to bloom. Should be an interesting weekend; rain off and on, which will make the humidity unbearable. Hopefully I will be able to make it to the Fiber Frolic on Sunday. Have a great weekend everyone! Uh oh, I see another project coming up. 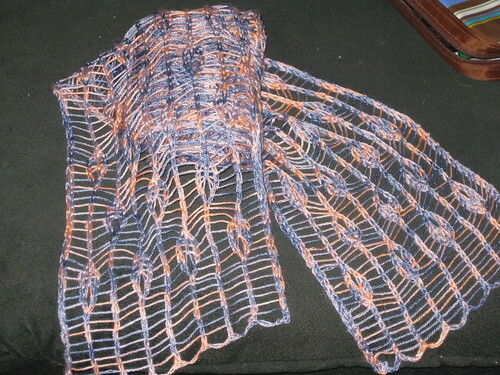 That is one very pretty little scarf.